Do you wish you cooked more of your own food? Are you stuck in a cooking rut? Do you want your dinners to be simple, easy AND fun? Then 30-Dinners may be just the thing for you! 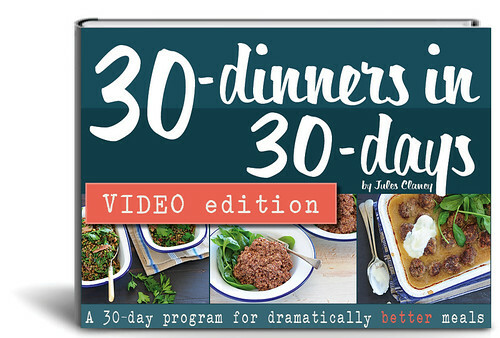 ’30-Dinners in 30-Days’ is a downloadable eWorkbook designed to help you revitalize your weeknight meals. It’s a step-by-step guide to help you, transform dinner time into the healthy, delicious meals you deserve. 1. A lesson – for the why and how this step will help you. 2. An action – a specific task to help you actually apply the lesson. 3. Learn more – links to further reading. 4. A recipe – an example of a dinner using the lessons in the step. These 4 aspects mean you’ll not only learn HOW to make better dinners, you will have actually done it and made better meals. I’m so confident that 30-Dinners can help, I’m backing it with a 100% money-back guarantee. Like a sneak peek inside? The eBook is broken into 30 ‘days’ but it’s up to you how you work your way through them. 1 lesson per day – work through as the workbook was designed. 1-2 lessons per week – take your time and spread the lessons out. Intensive chunks – work through multiple lessons on the weekend. Occasional inspiration – dip into the workbook from time to time. PLEASE NOTE: The 152 page eWorkbook contains 36 recipes, some are completely new but many have been published previously on www.thestonesoup.com. Still not sure if this eBook is for you? 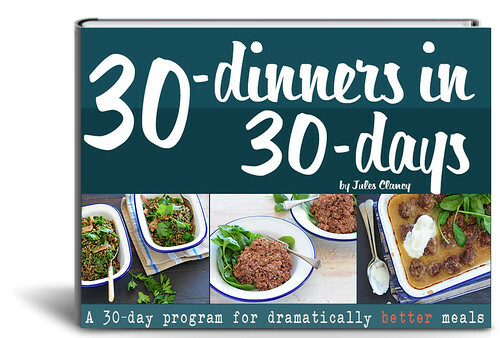 ’30-Dinners’ is for anyone looking to make their dinners easier, tastier and more fun. It’s suitable for beginner cooks looking to gain confidence AND for more experienced cooks, looking to simplify their time in the kitchen. It’s NOT for anyone looking to spend hours in the kitchen to impress with fancy, ‘master chef’ skills. √ Re-framed how you think about dinner so you actually enjoy it. √ Discovered new ingredients & cuisines, bringing fun back to your dinners. √ Designed a plan for your pantry and your kitchen equipment. √ Developed relationships with suppliers like your farmer’s market and butcher. √ Learned to cook with the seasons without obsessing. √ Mastered the art of using you fridge and freezer. √ Discovered healthy ways to utilize convenient ingredients and meals. √ Made a variety of quick, tasty meals. After the 30 steps you will have transformed how you approach and make dinner. If you aren’t happy with your eWorkbook, just email me [jules@thestonesoup.com]. You’ll get a 100% full, prompt and friendly refund. We part as friends. No questions asked. All the risk is on me. You have absolutely nothing to lose. Q. What’s the difference between the video and standard editions? A. They’re exactly the same but the video version contains links to videos for each recipe. Q. Are all the recipes new? A. The 152 page eWorkbook contains 36 recipes, some are completely new but many have been published previously on www.thestonesoup.com. Q. Does ’30-Dinners’ have vegetarian / vegan alternatives for the recipes? A. Absolutely! EVERY recipe in the book includes alternatives for vegetarians. Most also include a vegan option as well. Q. Will I be able to read the eWorkbook on my ipad, kindle fire or tablet? A. Yes! The ebook is in pdf format. There are detailed instructions for saving to your ipad / iphone on the download page. Q. I’m not a confident / creative cook. Will I be able to tackle the recipes and actions? A. Yes! All recipes are easy to make and only use 5 ingredients. They’re also quick. Most recipes can be made in 15 minutes or less. The action steps are designed to keep things as simple as possible and still give you results. A. Yes! Each recipe comes with variations to suit the more common food allergies. Although if you find the recipes aren’t suitable for you, you can always request a refund. Q. I prefer print books. Is ’30-Dinners’ available as a traditional book? A. I’m afraid not. All my books are ebooks except for my print books ‘And the Love is Free’ and ‘5-Ingredients 10-Minutes’. But I know plenty of people who buy my ebooks and print them themselves.